The stage has been set for the dramatic return and continued question of Kai, the Lone Wolf! We decided on adding a chainmail coat (+4END) and a Healing Potion (+4 END) to our inventory from the King's armory. Thanks to some kind of oversight from yours truly, unfortunately the "Which Kai Discipline" poll didn't go live, so I'm just going to make a command decision and, based on Myro's suggestion, we're taking Hunting. You can see our full character sheet here. So which will it be, intrepid adventurers? Do we spear our unknown assailant, or do we rely on our might thews (honed through years of hiding and running) to yank ourselves free? 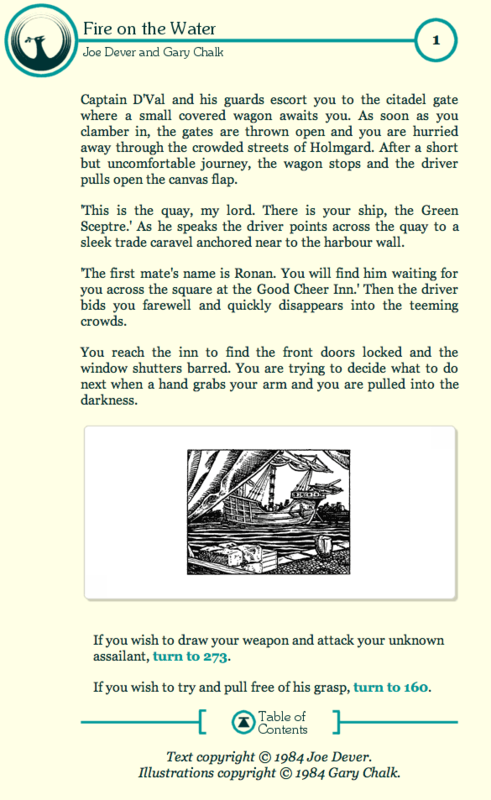 This entry was posted in Lone Wolf: Fire on the Water, RPG Corner. Bookmark the permalink. Let’s find out who it is first, we could be shanking an ally. “Shank or Yank” would have been a MUCH better title. Dang it Gero, where were you when I was writing the darn thing?! I suppose we ought not to attack him yet, in case he turns out to be the first mate. But is it more in character for us to struggle to get free as a prelude to running away, or to flail blindly (possibly literally, our eyes closed tightly against potential soil-inducing fear-creatures) at danger until we can safely run away? Decisions, decisions. Pull free, at least to see who has grabbed us. I mean, why start initiating fights now, when we’ve already made it a habit to run away, to live to run away another day? I don’t know if logic is really the way to go on these things, but I figured that if the inn is closed, something untoward has occurred to make its denizens bolt. If the stranger wished us harm he would have just stabbed us instead of pulling us to a less conspicuous place, away from whatever motivated the shuttering. Of course, he could be looking to capture us for some sort of hostile interrogation. Or he might not be a he at all, but some lissome wench who fancies lone wolves. In any case, mindless violence is always an option later, and better accomplished outside of anyone’s grasp.